You'd have to be a real doof—or a little bit mad—not to see the value here. This review was published on September 14, 2015. Since then, this product may have been discontinued or replaced. Pricing and availability may differ from what is stated in the review. The premium TV landscape is being taken over by an alphabet soup of buzzwords: HDR, WCG, Quantum Dot, Dolby Vision, OLED, ULED—I've even seen GLED pop up in discussion. Whatever happened to just good old-fashioned 4K? Well, it got a heck of a lot cheaper, for one thing. Take the Sony XBR55X850C for example. It retails for $2,599, but you can find it online for as low as $1,499—right from the horse's mouth, in fact. For that price, you're getting a pretty sizable 4K LED smart TV with an Android-based smart platform, 4K-capable apps, and Sony's "Triluminos" color system. The parts make for an excellent 4K TV that delivers high value. The only drawback is that the X850C relies heavily on the use of backlight-limiting functions, so something like Vizio's M Series may be a better choice if you've got a bright room, but this Sony is a top-notch choice for movie lovers. The X850C series is Sony's midrange 4K option for 2015. Unlike the smaller, more budget-friendly X830 TVs, the X850 is available in 55-inch (Sony XBR55X859C), 65-inch (Sony XBR65X850C), and 75-inch options (Sony XBR75X850C). The TVs are identical in connectivity, design, and features. They do differ in one way, however, and it's quite important. While the 55-inch X850C we're reviewing (purchased new from Amazon) is an edge-lit LED model, the 65- and 75-inch X850C models feature full-array backlighting. This difference in backlight type can make for a big shift in performance when it comes to black level, max luminance, backlight uniformity, viewing angle, and even color accuracy. For this reason, we ask that readers consider the 55-inch CX850's performance separately from the 65- or 75-inch versions, which we'll test at a later date. Thin from edge-to-edge and dressed in professional trimming, the X850C looks great. With the popularity of full-array LED backlighting on the rise we haven't seen as many super-thin TVs this year, but the edge-lit 55X850C is about as thin as they get—sort of. While it's not very deep at the edges, it fattens out towards the bottom of the panel where the on-set controls and ports live. From the front, however, the X850C strikes a modern pose. The large screen is bordered by discreet black bezels, and perches upon a minimalist metal bar. The X850C's rear casing is simple charcoal-colored plastic. It's sturdy, but not so much that the TV has unnecessary weight. The 55-inch X850C strikes a minimalist pose when viewed from the front, bolstered by skinny bezels and a trim metal stand. On the back of the TV, you'll find a good selection of audio-video ports, including four HDMI inputs (all HDCP 2.2/HDMI 2.0 compatible) and three USB inputs. For sub-4K/HD signals, there's also a shared component/composite input and a coaxial input for cable/antenna. Sony doesn't skimp on audio options either: you'll find an analog/headphone output amongst the side-oriented ports, and a digital audio output jack at the rear. The X850C includes a small, touchpad remote that's optimized for Android TV. Sony also throws two remote controls into the mix—mmm, fancy. One is the standard infrared type: stuffed with buttons, easy to use, but nothing to write home about. The other is a smaller touchpad variety that's much sleeker and sexier, and clearly optimized for use with some of Android TV's smart features. Android TV delivers—but we're not completely convinced we want to sign for it. Sony announced its new "Android TV" smart platform during CES last January, confirming the inclusion of the popular mobile browser on most of its high-end HD and 4K lineup. As one of Sony's upper-crust 4K TVs, the X850C is equipped—but whether that's for the best really depends on what you're looking for. Whether you're primarily an Apple user or rock the 'Droid on a daily basis, we're willing to bet you've used Android before. 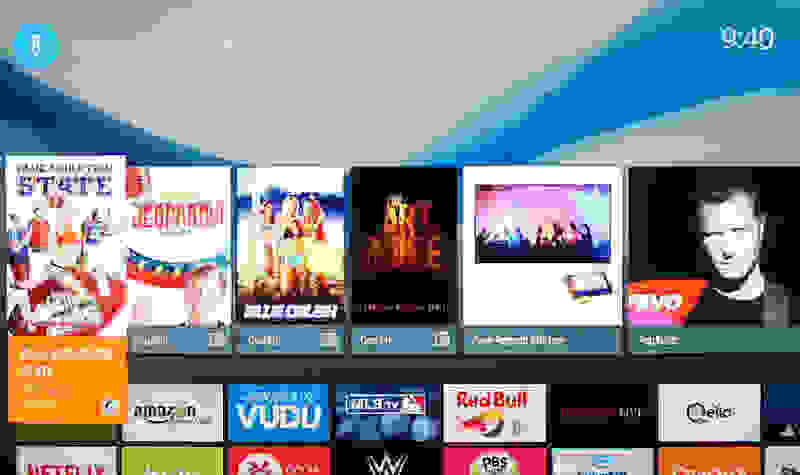 The Android TV platform is very similar, adhering to the same brisk layout as the mobile variety with a of focus on saucy colors and legibility. Apps and widgets scale well to the 4K screen, which is great to see, as almost no smartphones or tablets offer 4K yet. The initial Android TV layout feels a little cluttered compared to some of the year's sleeker smart TV platforms. That similarity can be a bit problematic, however, as the sheer breadth and scope of the Android platform seems (at times) to be a bit much for the X850C's processor. I found myself consistently frustrated by long load times, if only in comparison to simpler and less ambitious smart TV setups. If you can be patient with the occasionally sluggish interface, however, you'll be glad to know that there's enough semblance to Google's popular OS to justify your time. You can sign into your Google account the same way you would on a smartphone or tablet and find almost immediate parity between your mobile PlayStore and Sony's Android TV. But while you'll find plenty of visual similarity, you shouldn't expect a one-to-one app ratio here. Only "TV certified" Android apps are present, with uncertified apps simply not available for purchase or download. 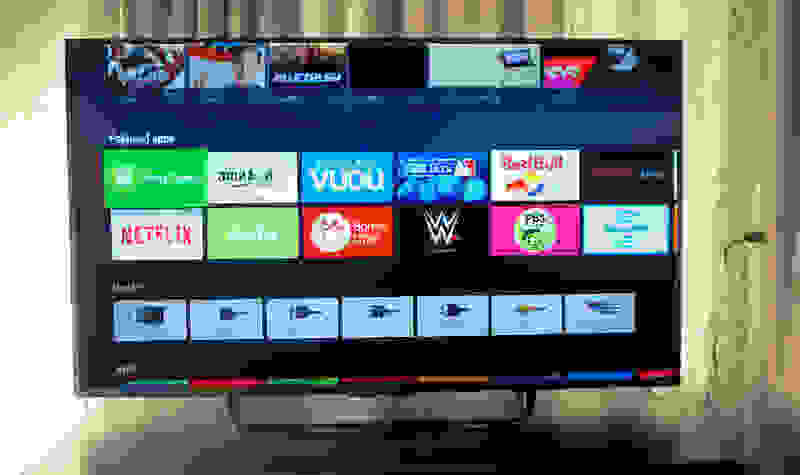 This is where Android TV is at an odd crossroads: it lacks the minimalism and "shared screen" emphasis of other modern smart platforms, but is still a longshot from the customizability and sheer scope of a mobile Android device. Rather than going whole-hog in one or the other direction, the Android TV platform ends up as either a cluttered addition to a TV experience, or an impoverished version of a traditional smartphone experience. The good news is you aren't exactly paying a mint for it. With the wide adoption of Android by both hardware-makers and app developers, the platform isn't adding much to the $1,500 price tag on a 55-inch 4K TV. Even still, picky/power users may find the platform an unnecessary addition considering the X850C's real strengths are picture quality and processing software. A quality panel bolstered by some seriously smart software. 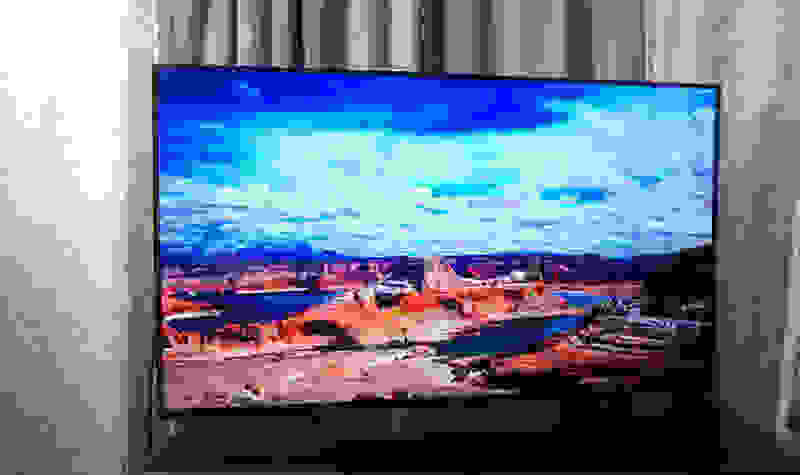 Before getting into the viewing experience you can expect from Sony's 55-inch X850C, it's important to make note of the TV's software functions, what their aim is, and how well they work. While testing revealed that this Sony's core panel performance—things like color accuracy and gray/white neutrality—are quite excellent out of the box (in the Cinema home and Cinema pro modes, especially), much of this TV's picture quality stems from smartly integrated software enhancements. The X850C uses a version of quantum dot called "Triluminos" alongside backlight scanning and local dimming to create a picture that's both rich and realistic. Crucially, the X850C's "advanced contrast enhancer" successfully mimics the local dimming we've seen on some of the full-array LED TVs we've tested. While it's obviously not as effective as a TV with full-fledged hardware local dimming, it does make for some impressive shadow tones most of the time. In fact, the black levels I measured in the TV's Cinema pro mode are some of the best we've seen on an LCD this year. For an edge-lit model, that's really saying something. Not only does the TV's dimming work to create darker-than-usual shadows, but elements of the X850C's motion-enhancement mode—"Motionflow"—use what's called backlight scanning to make for better motion performance. The side effect of this backlight scanning is that the X850C simply isn't very bright by default—at least not in the Cinema picture modes, which put accuracy and performance first. This is perfectly suited to a dark, home theater setup, but hampers the TV's bright-room performance. The X850C strikes an excellent balance between accuracy and flair, adding just enough extra color to tantalize without overdoing it. You can turn all of the X850C's software off and brighten it up a lot, but unlike last year's X900B—where dimming elements were a little too aggressive at times—the software is very well-implemented this year: in fact, the TV is factory calibrated to work in conjunction with them. This makes for a home theater-appropriate, rich, accurate picture, as we found during viewing. How does this all translate into viewing? There are pros and cons, but much more the former than the latter. The TV's naturally subdued appearance doesn't immediately conjure the bleeding-edge, "flagship" vibe of some of the year's quantum dot/HDR sets, but the X850C is actually capable of very rich color and bright, pinpoint highlights—areas where edge-lit TVs don't always flourish. 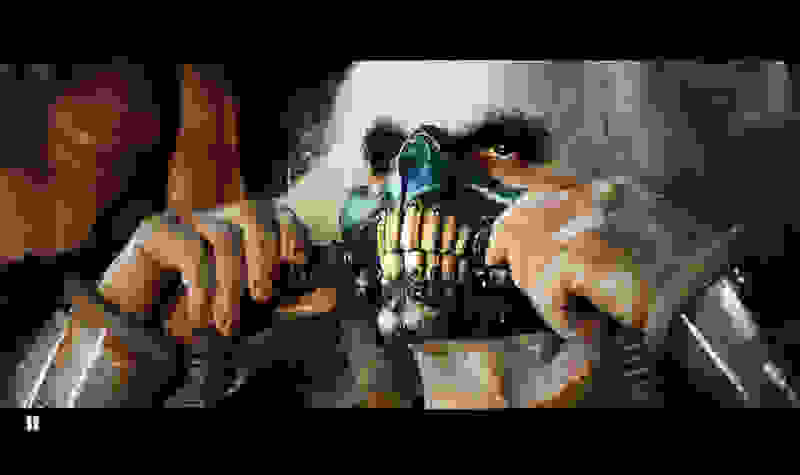 We watched a large portion of Mad Max: Fury Road, freshly released on Blu-ray. The X850C looked excellent. Our one major complaint: the letterbox bars—the black bars above and below the screen—could've stood to be darker than they were. 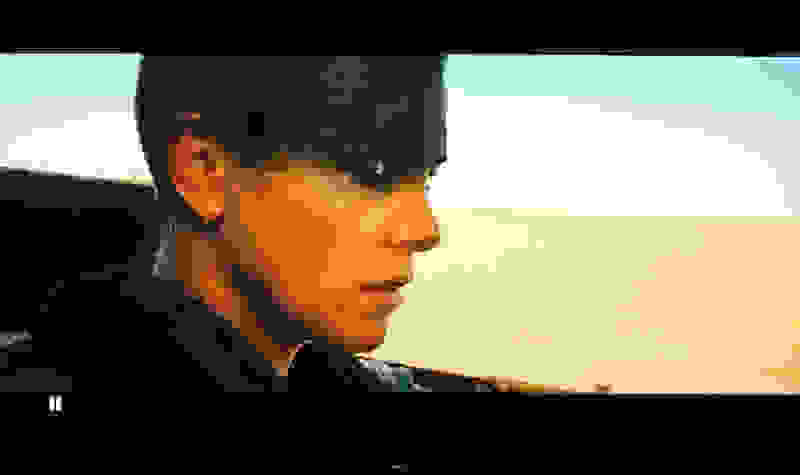 But while Mad Max sits at a fairly high screen brightness much of the time, the TV still provided pleasing contrast from scene to scene, giving a little bit of pop to the otherwise flat desert. For an edge-lit TV, the X850C's ability to render shadowy elements side-by-side with brighter backdrops is impressive. I was also impressed with the TV's motion while watching in Cinema home mode, where the TV's "Motionflow: True Cinema" motion compensation and backlight scanning is enabled by default. 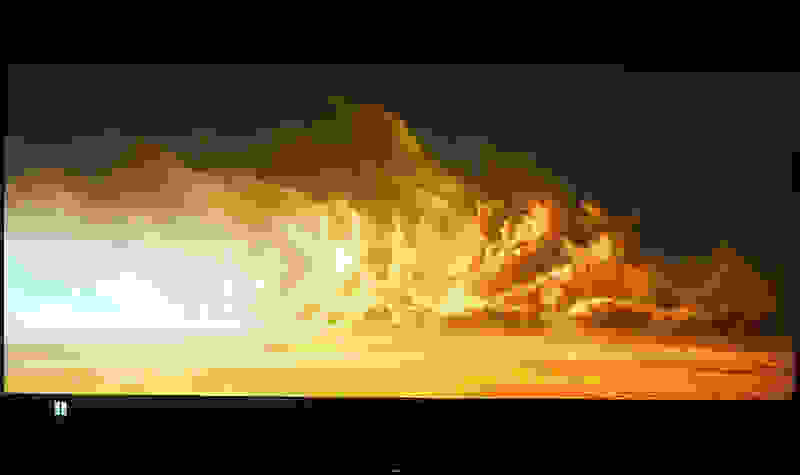 Without a touch of the soap opera effect, the TV chewed through the motion-heavy Mad Max while preserving details and exhibiting minimal blurring. Even with the extra color enabled, the X850C manages to create clean, neutral whites and grayscale tones, cementing the accuracy of the picture. Colors and neutral tones were also quite accurate, with one exception—red. 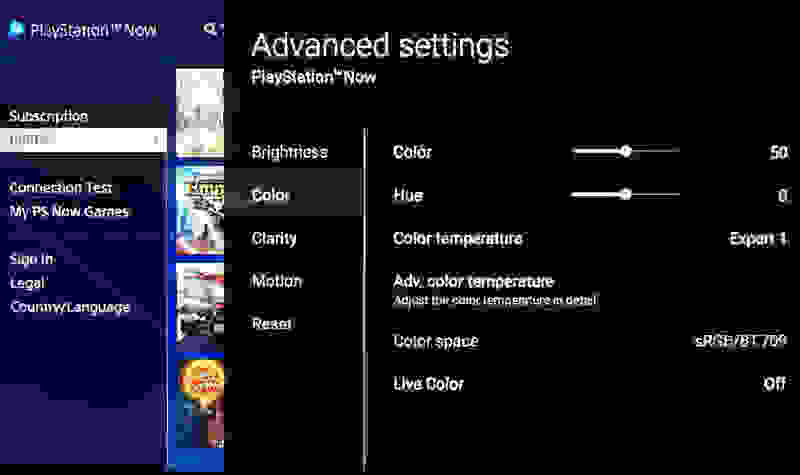 While the X850C can match standard HDTV color with the best of them (specifically in the film-oriented Cinema pro picture mode), it also offers quite a bit more via Sony's "Triluminos" color system, which is employed in most other modes by default. For Mad Max: Fury Road, the extra color resulted in richer, browner deserts, an extra-intense blue haze during the movie's night scenes, and leafy greens so vibrant it looked like Immortan Joe's water had been enriched with Miracle-Gro. We imagine this kind of thing might be a little much for something like a nature documentary or a football game, but it's also easy enough to dial back in the menu. The X850C's added color doesn't affect this blue-tinged night scene too heavily—it's supposed to look like that. Red was a slightly different story, however. 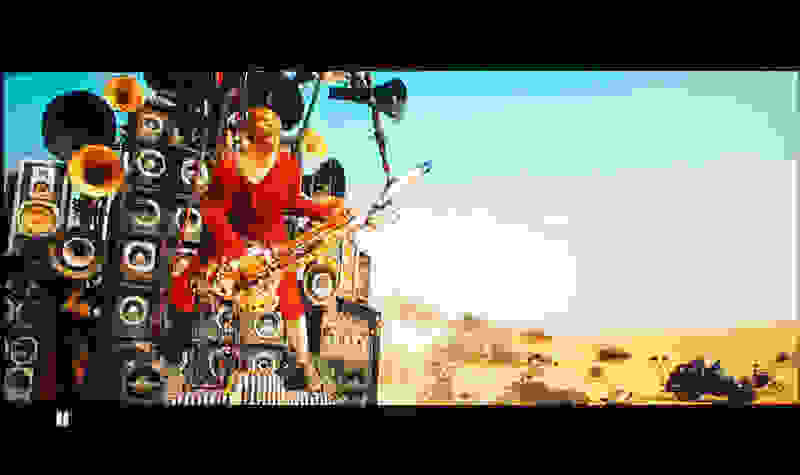 Everything from the IV line between Max and Nux; to the edges of the movie's many flaming cars; to the Doof Warrior's hastily assembled garb were absolutely searingly bright and saturated, almost to the point of distraction. Some of this may be the mastering on the Blu-ray, but I've no doubt most of it is from the X850C itself. It's not (necessarily) a bad thing, but it might be a little jarring for purists. When taking full advantage of its wider color space, the X850C produces reds of such intense saturation that they're almost distracting. Finally, the X850C deserves some praise for its ability to upscale. Like some of the other 4K sets we've seen this year, the X850C stretches 1080p footage (like Mad Max) across its 4K resolution without missing a beat. 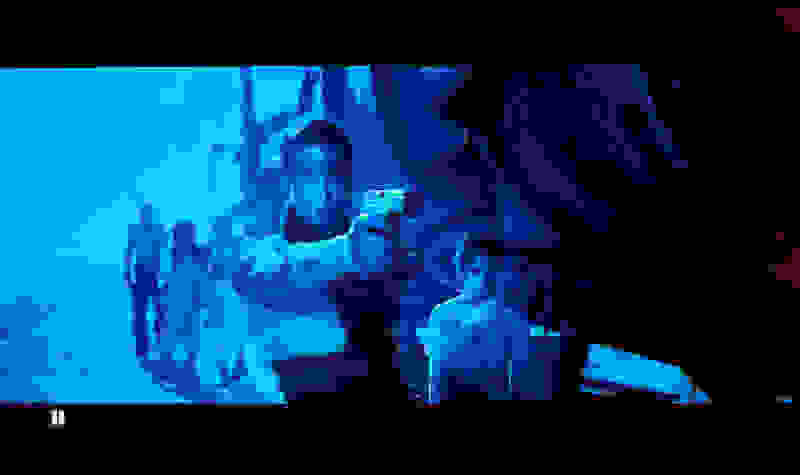 Some scenes even looked richer for the added resolution, such as the long shot of Max face down in the sand. And naturally, native 4K content looked excellent—now we just need more of it. Some scenes with a high amount of small, subtle details, are actually easier to appreciate on a 4K TV like this one. Sony's 55-inch 4K delivers stellar value for the price, though it's not entirely flawless. When you're shopping for a new TV, it can be easy to get caught up in the hype surrounding the newest, flashiest options. But while Sony's midrange 4K doesn't quite shout its own praise, it could certainly stand to. This TV delivers a winning trio of looks, features, and picture quality, and it does so for a very fair price. But like most TVs, especially edge-lit LEDs, the 55-inch CX850 is not without a few flaws. It's capable of great contrast, but its black (letterbox) bars don't get very dark, and it also simply isn't the brightest TV, a drawback of its focus on the best film/movie presentation. Unfortunately, this means it's not always the best choice for a dark theater or a bright viewing room, but lives somewhere in the middle. If you're in that middle, however, Sony's X850C is a stellar choice for $1,499. In fact, for a picture that manages to walk such a fine line between high accuracy and super-rich color, it's not too much to ask that you dim the lights or draw the shades. Just don't go in thinking you're getting a full Android experience on your TV—buy this one for the picture quality.